The excitement of the holidays has passed, our trees are taken down, decorations put away, but where we live we still have a couple months of cold, cold Winter. These are the months where our need to head to warmer pastures becomes greatest and today’s Tiny Tour isn’t helping matters. Not to mention that more than one of us dreams of raising our boys at the beach, our envy is at an all time high today! 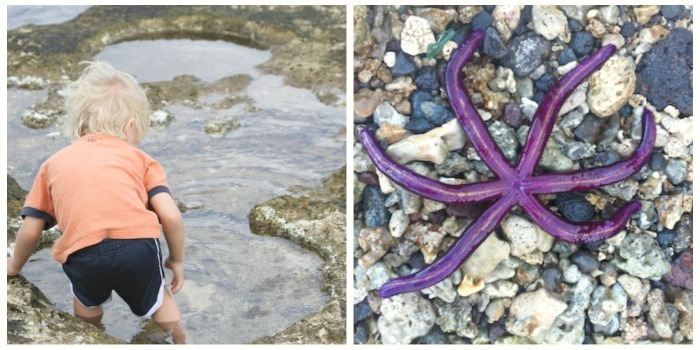 Please welcome, Monica the The Grommom, who is sharing her favorite family-friendly stops on the North Shore in Oahu, Hawaii. I happen to think that our North Shore community is one of the greatest places on earth, so I am really excited to share it with you! When most people think of Oahu, they immediately think of Waikiki…A busy city, full of tourists, and crowded beaches. But up here on the North Shore it is an entirely different world. People still consider the North Shore “country,” with miles and miles of uncrowded beaches, and a much slower pace to life. There are farms growing tropical fruits, horse farms, and only two-lane roads. Two of my boys are competitive surfers and skate boarders, and around here we call kids like that, “grommets,” or “groms,” (thus the name of my blog, “The Grommom.” ) As a family we thoroughly enjoy this beautiful place we call home. I’m doing my best to cut my list down, but trust me when I say that the North Shore of Oahu offers you plenty of options for as much activity, or relaxation, as you could want. 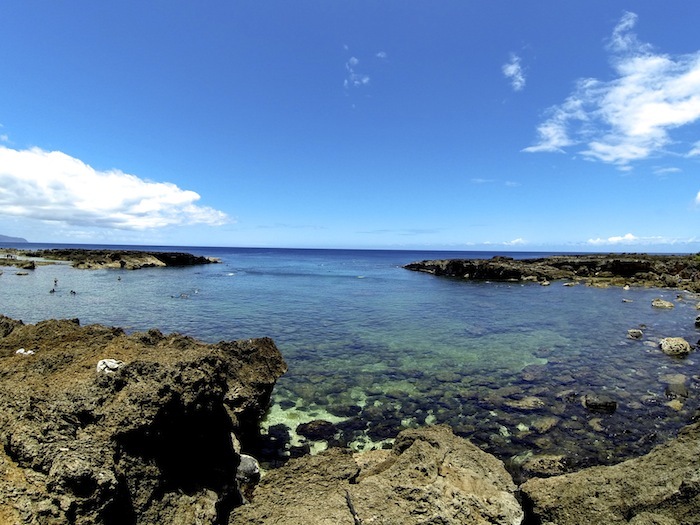 There are a lot of places on our North Shore that are great for snorkeling and playing in tide pools, but Sharks Cove is a favorite. Our ocean is almost always warm, especially in the shallow tide pools. They are absolutely beautiful, and there is always something fun to discover. Shell collecting, and hands-on-marine biology, at your finger-tips. The perfect beach for sand and swim! 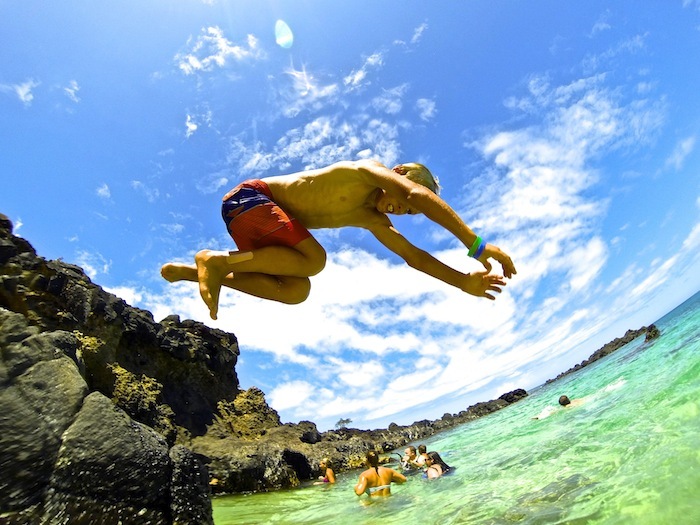 Big kids love to JUMP off of the famous Waimea Bay Rock, and Little ones can play in the sand, splash in the water, or (on a lucky day,) watch dolphins swim through the bay. Once you climb up the trails, you can enjoy the view from the top! Or, if you’d prefer to stay on flatter grounds, we have a wonderful bike path/boardwalk that goes for miles…with peeks at the ocean and the surf, all along the way. It’s just what you do when you’re in Hawaii. 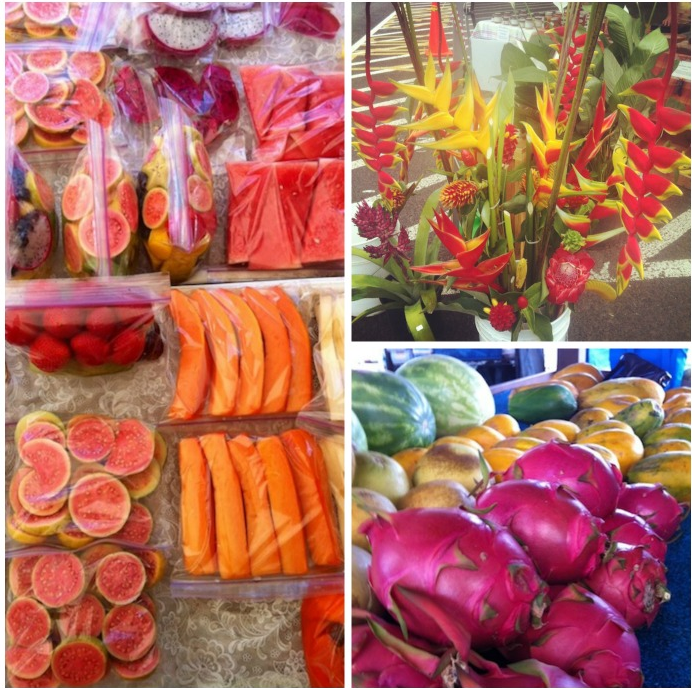 We love our Farmer’s Market which is held every Thursday afternoon in Waimea Valley. There are also a couple on the weekend locally. The boys and I also stop by roadside stands to get tropical fruits, fresh coconut water, and sweet sugar cane to chew on! The locally grown flowers are pretty amazing too. I can’t leave out the mentioning the HONU. 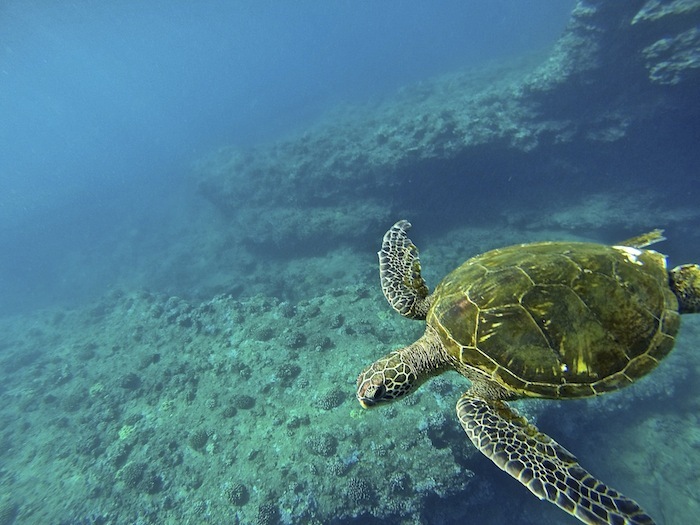 (Honu is Hawaiian for sea turtle.) 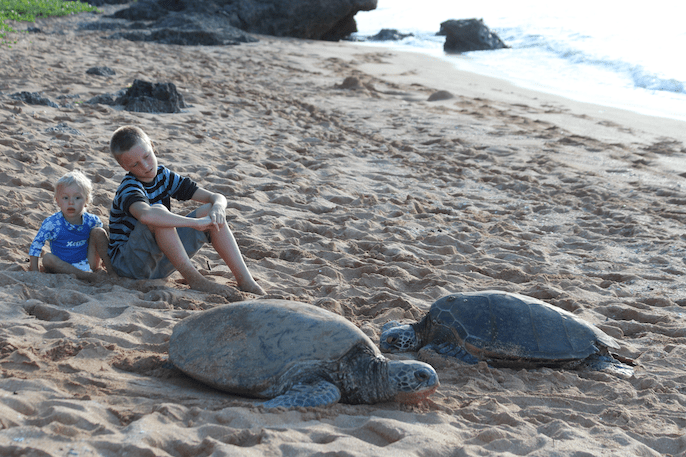 Our sea turtles are loved by both locals, and the tourists who come to visit. You can often find turtles sun-bathing right on public beaches. If I had more space I’d begin to tell you about our favorite restaurants, and shops. (There are a lot!) Surf lessons, sky diving, deep sea fishing, and shark tours are just a few more fun activities to enjoy on the North Shore. I do keep a listing of our “North Shore Favorites” on the top menu bar of my blog, so feel free to visit here. I can promise you a visit to the North Shore of Oahu will not be disappointing! You know that saying, “If you’re lucky enough to live by the beach, than you’re lucky enough”? We’re thinking this definitely applies today. 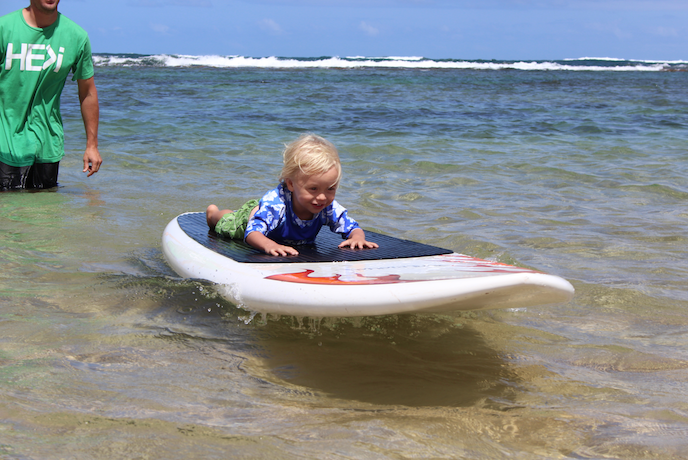 To follow along with Monica and her cutest surf-boys head to the Grommom blog, Instagram, Facebook and Twitter! Find all our Tiny Tour series’ posts right here. Warning: Wanderlust to follow. I loved this! I am trying to plan a Hawaiian vacation this year (I have family living there + I’ve never been, shame on me!) so this was very helpful! If I could get that close to a sea turtle, I could die happy. What a beautiful place to live. Thank you Sarah! I hope you make it over here, and please stay in touch if you do! Aloha! Haha…If it helps any, my boys and I love to go online to find pictures of snowy, cold places to imagine being at this time of the year! 🙂 But no-I’m not complaining..:) aloha! I love that you say “If I had more space”…cause you do! You completely skipped number 3. I really, really, really want to know what number 3 is on the list. Oh my….Did i really? How did I do that!!? Hilarious. 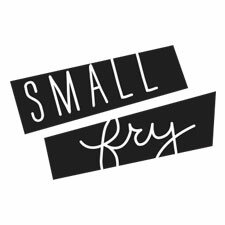 Ok, I’ll ask the girls here at Small Fry if I can do a follow-up Tiny Tourist, ya know–So I can get back to that #3! haha. Aloha! Thank you Rachel! So sweet of you. And you’d laugh if you heard all of us lately saying how “freezing” it is at night…Low 60’s!!! Brrr. 🙂 Aloha and I do hope you make it over here! 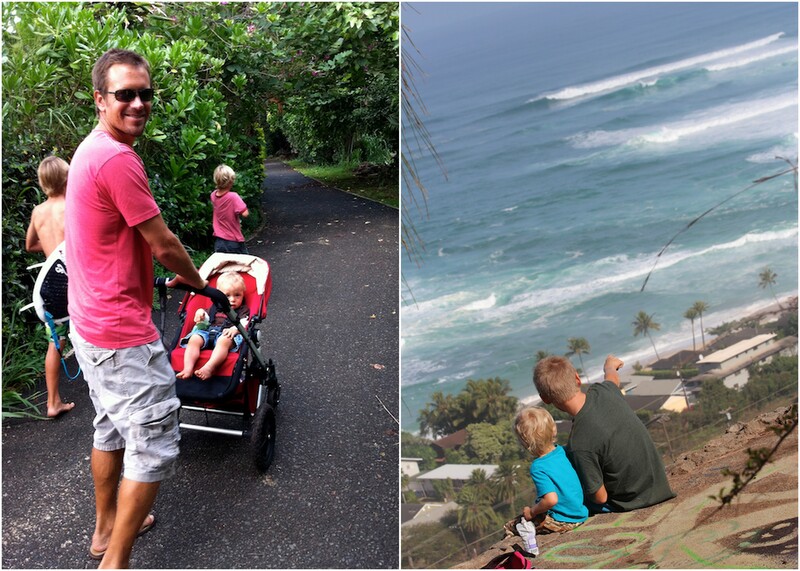 I would love to know where these family friendly hikes are on the North Shore. We visit a lot & I’d love to have new ones to add to our repertoire. 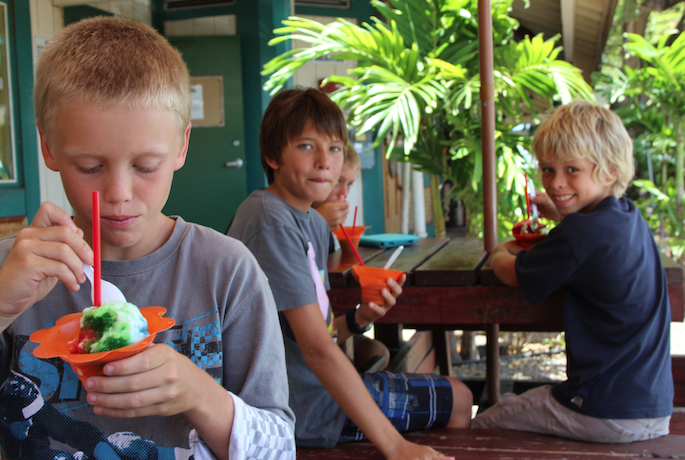 And which is your favorite North Shore shave ice? They can be so hit or miss. I haven’t found any Oahu shave ice that compares to Maui’s Ululani’s. Recently, I’ve been very dissapointed in Matsumoto’s. Wow… what an amazing place for kids to grow up! These are such awesome pictures! Thank you for sharing! !